If you’re going to Spain, you’ll definitely want to go for tapas at some point during your travels. Many people don’t understand what tapas means and may have all kinds of ideas as to what they are, which can be confusing. For one thing, the word tapas is the plural form when used in the Spanish language. This means that the singular term is tapa. There is, however, an explanation as to why the word is often treated as singular. 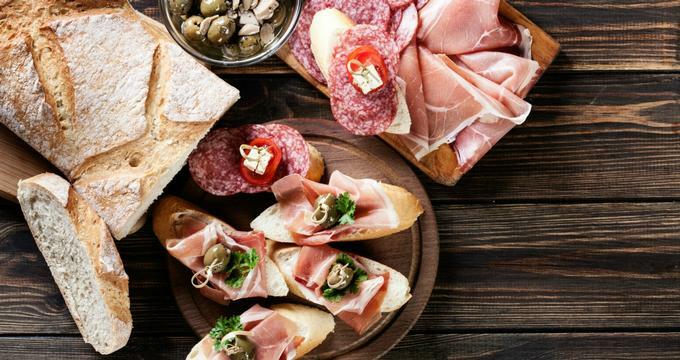 This is because when used in the English language, the word tapas has a similar function as the term “a la carte” and, when used as such, the word is often treated in its singular form. In short, when you’re in Spain, it’s correct to say that you want to get one tapa or two tapas. But when you’re using it in an English-speaking country, use tapas as a singular word. - Tapas is actually not a kind of food. It’s rather the way your food is served. The word “tapas” is used to refer to any small food that comes with a drink, and includes paella, ham and cheese, toast, croquettes, and more. - While the word has a Spanish meaning, the food served as tapas doesn’t always have to be Spanish. For example, Moroccan restaurants offer kebabs, falafel, and couscous as tapas. - Contrary to popular belief, tapas are not supposed to be a starter dish. People just eat it, no matter how small the plates are, until they’re full. - It’s also not supposed to be a mix of tiny dishes that are presented on a platter. That arrangement is properly called a tabla in Spanish. - The drink was covered up to keep flies away. - The cover served to mask the scent of bad wine. - To keep the drink from spilling. There is also an old story of a king who couldn’t drink wine without having it with food. Because of this, he issued a decree that people should take food with their drinks. Other variations of this story claim that the decree was issued for health reasons, seeing as how drinking alcohol on an empty stomach can be bad for you. While the myths about tapas can be interesting, tapas today really just refers a small dish – with the emphasis on “small.” That is, it can be a menu item that’s offered in a small serving, or a miniature version of a larger dish. Some time ago, tapas were given away in restaurants for free, but if ever you get tapas in a restaurant without asking for them today, consider yourself lucky. Those who go looking for tapas in Spain will find themselves visiting different bars and ordering a single type of tapas on each visit. This can be intimidating for someone who doesn’t know the city, so having a friend who knows the area can be very helpful when looking for the best tapas in town. Interestingly, tapas tours are actually a thing in Spain, so you can get to know the local tapas scene of each city you visit. - Logroño: Go to Calle Laurel and Calle San Juan, the two best places for tapas in the wine country. Both streets continue to grow as a tapas destination and have come a long way from being just a place for tapas and drinks to becoming the fanciest tapas destinations in Spain. - San Sebastian: Known as the city of gourmet tapas, San Sebastian’s streets are simply riddled with amazing tapas bars, locally called “pintxos.” One of the best places is Calle 31 de Agosto. While freshly cooked tapas are best, you’ll also see a lot of bars that have cold tapas displayed, while others offer a self-service approach. When you’re not sure what to do, try to imitate what other customers are doing. - Granada: Want free tapas? Granada is definitely the best place for free tapas in Spain. Some bars will offer you a hamburger and fries with your drinks, while others will offer decently sized food. Of course, the fact that it’s all for free means you can’t pick what you want, although buying more drinks means you’ll get better dishes. The fact that you don’t get to pick your tapas means you’ll find bar-hopping a somewhat more exciting experience. - Seville: Along with San Sebastian, Seville is a city that promises one of the best gastronomical experiences in Spain. Their bars a bit spread out, so you’ll want to do a bit of research before deciding where to go. Consider the Paseo Catalina, Plaza los Terceros, and the Avenida de la Constitucion area. - Leon: If we’re talking about the best places for free tapas, Leon is right there with Granada. The Barrio Humedo area is filled with cafes that give out free tapas. While it’s not as touristy as Granada, Leon makes up for it by offering lots of unique local dishes, like cecina and morcilla. - Malaga: Tapas in Spain are usually reasonable priced, but Malaga offers some of the cheapest tapas in Spain without sacrificing quality. The downside is that you’ll have to put up with the low-quality bar scene, but the fact that everything is close by and within walking distance more than makes up for it. Chances are, you’ll be spending a lot of time on your next Spain trip trying out tapas, so it will really pay to do a bit of research before you travel. A quick search for local tapas bars in your destination will ensure you get the best bar-hopping experience.